Lukes Gaming Blog: Quest for a quickshade alternative. Well last week my loyal can of army painter quickshade final died. It been on it's last legs for a while now, a film seemed to form over the top of the shade after about 24 hours of removing the last one. I must have lost about half the tin this way. Before parting with £20 for a new tin I thought about alternatives. After all quickshade really is only woodstain at the end of the day, so could a cheaper tin from a DIY store do the same job? After some google research I discovered that the general consensus online is that the stuff to be using is an American brand called Miniwax, sadly unavailable in the UK. However a few people where singing the praises of B&Q's own brand of interior Rosewood varnish, which was only £5.99 a tin. I popped down to my local branch and bought some last weekend. The first thing I would say is that it looks rather different in the tin to quickshare. It's almost grey in appearance. 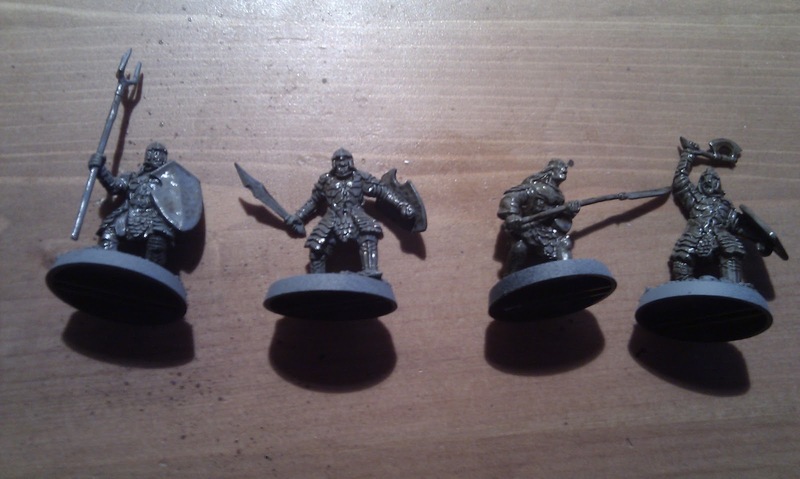 I dug around in my bits box and found some old LOTR Orcs for practice. 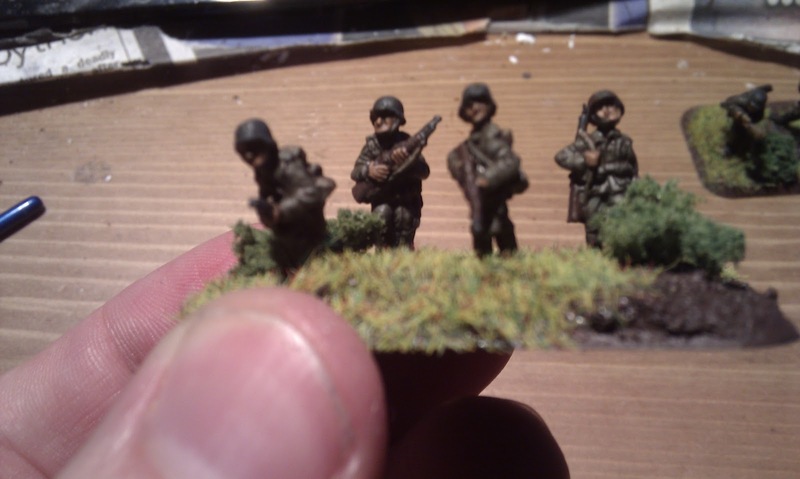 I sprayed them a nice Panzer Grey and brushed them with various thicknesses of varnish. After a few practice tries, I worked out the following technique. Take a small amount of varnish from the tin with your brush. Thin it slightly on a pallet, I find the correct ratio is about 4 parts Varnish to 1 part water for a clean finish, however you may wish to experiment. I found that it had a dirtier finish if applied straight from the tin, but if you are shading a model with a dirty appliance, such as an orc or undead model this may be ideal for you. Slap it onto your model, don't worry at this stage about getting too much on. Leave it for about 1 minute, then using an empty brush collect up the pools of varnish that have accumulated. At this stage the varnish will still appear grey, this will turn brown later on as the varnish dries. The varnish is dry to the touch in about 30-40 minutes. Zap the model with your favorite matt varnish. Here is a infantry stand shaded using B&Q varnish and the results are excellent. It's certainly a recommend purchase.